Teachers in high-poverty schools know that students don’t leave their hunger, sleepiness, and anxiety at the door. We’re *almost* to the point as a nation where we can all agree on that. But for some students, not just those living in poverty, but many working class and middle class students, another quiet anxiety nags at them, and it’s one that teachers are rarely trained to address. Some students are afraid of being deported. Or they are afraid that their parents will be deported during the school day. And many of them are afraid to talk about it. That’s what Relay Graduate School of Education students learned on Saturday when Julissa Arce spoke to around 100 members of the San Antonio cohort. Arce’s story of her life as an undocumented immigrant is the subject of her two books, My Underground American Dream and Someone Like Me. After graduating high school in San Antonio and college at UT- Austin, Arce went on to work on Wall Street. She was making six figures with a fake Social Security Number (something she is quick to admit is not advisable. But before you cry “fraud” please not that this only allowed her to pay INTO Social Security, not to collect. Undocumented immigrants using fake SSN pay about $9 billion annually in payroll taxes, including SS.) and sweating every single day until she obtained her green card, and finally her citizenship in 2014. She has become an advocate for both DACA recipients and those who lack documentation entirely. Her talk at Relay helped the teachers gain insight into what their students without legal status— or those with family members lacking legal status— might be going through. They don’t get to see themselves reflected in pop culture or national role models. Arce moved to the U.S. when she was 11, and until then used pop culture to imagine what Americans would be like, or what life in the U.S. was like. While she was relieved to see that tons of people in San Antonio looked like her, she said, she still rarely saw Latinas celebrated in history books or news stories. 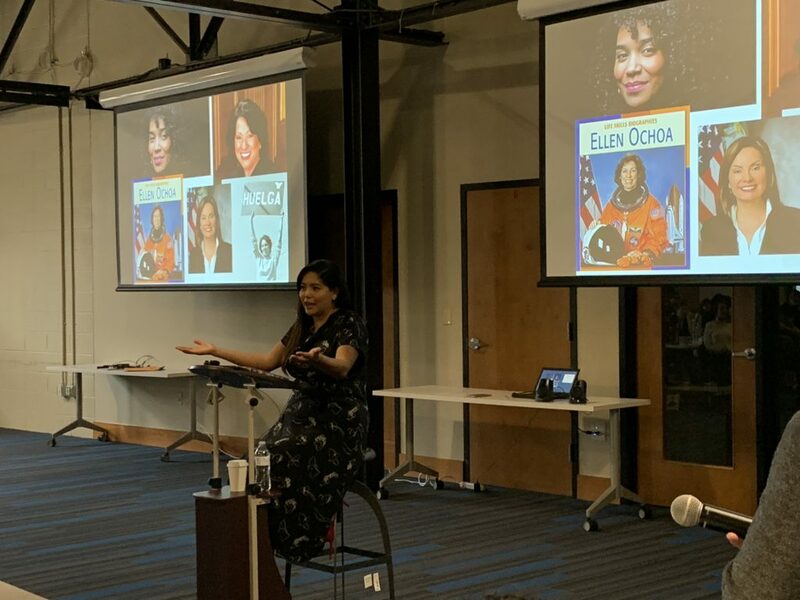 She explained this against a backdrop of photos of Latina trailblazers—Sonya Sotomayor, Ellen Ochoa, Dolores Huerta, and more. These were women who she never learned about in school, even in San Antonio where so many students would benefit from seeing Latinas in influential and aspirational positions. Muslim, South East Asian, and immigrants from African countries are likely to experience a similar void. They do see themselves portrayed as criminals, or as less intelligent. Arce was 14 when her visa expired, and her family was no longer in the financial position to be able to renew it. She learned she in the country illegally when her mom explained why she could not go back to Mexico for her quinceañera. It wasn’t long after that, she recounted, that she heard the term “illegal alien” on Fox News. It took her a long time to reconcile with the part of her identity that was outside the law. She was not a criminal, because she had not entered the country illegally. But few people understand the nuances of visas, green cards, permits, and residency status. Overstaying a visa is a civil infraction, which is how roughly 40 percent of undocumented people become undocumented, not a crime. However, the broad brush of political rhetoric makes no such distinctions. In the minds of many, she knew she was a criminal. To make matters worse, the perception that she was somehow less intelligent as she learned to speak English made her feel doubly stigmatized. Teachers can do a lot to help students understand the immigration system and increase respect for English Language Learners. When their peers admire their bilingual talents and know the right terminology to talk about immigration as a topic, students facing these hurdles feel that they are doing so in a friendly, non-hostile environment…even if their immigration status remains a secret. They often feel out of place in both countries—their home and their country of origin. One of the Relay GSE students asked Arce how she felt as an American citizen. Did she feel fully American? Did she identify with Mexico still in any way? Having lived with and without all the check boxes and language skills she now has, she doesn’t believe that she is any more American now than she was at age 14 when her documents lapsed. On the other hand, those years of being undocumented showed her the ways in which she would never be totally or singularly American. She had a life in Mexico before she came here, and while she doesn’t feel like she totally belongs there either, she wants to feel connected to it. The first thing she did once she could travel freely in and out of the U.S. was to visit her home in Mexico. Teachers need to know that their immigrant students are whole people. Pushing an assimilationist agenda without any cultural understanding is likely to traumatize students, because it devalues critical influences of their most formative years. A ten-year-old who immigrates will be 21 years old before the majority of her life has been on U.S. soil. Teachers can celebrate a student’s home culture by asking him or her to share customs and traditions…if the child wants to. They can welcome examples from a child’s home culture, and champion a bilingual child’s continued development of their native language. As the closest adult outside a student’s family, teachers often represent the entire U.S. to their immigrant students. They can make it a welcoming place where students do not need to diminish themselves to fit in. They are living a life they did not choose and cannot change on their own. It is understandably irritating when people ask Arce why she didn’t just “get in line” and fix her immigration status. (No one at Relay GSE asked her that. She just mentioned it as part of her story.) The line, she explained, doesn’t exist. Think of it less like jumping off the diving board and more like playing a game of Jeopardy! There are categories and criteria that applicants must satisfy. There are time limits. Once a person’s documentation has lapsed for a year, they become subject to penalties that make it even harder to get legal status. They loose access to public benefits. They become subject to deportation without their families. “No one would choose to be undocumented if they had another possibility,” Arce said. For children, or those whose documents expired while they were still minors, many come into adulthood without options. That’s why DACA was such a big deal. It wasn’t an option for people with other options. It was a lifeline for people who had none. Poverty makes being undocumented more difficult. Arce is very forthright about what she calls “privilege” and, frankly, luck, in her immigration story. The lucky moments are best read in the context of the book. But the privilege component is something teachers needed to hear. After legally immigrating as business owners, Arce’s parents fell on hard times. Without money, renewing their visa was impossible. The immigration process heavily favors those with financial means, Arce said. “Money and access to money makes a huge difference,” she explained. She was working for Goldman Sachs when she realized the two sides of her own coin. She could also buy things easily. Without legal status people cannot receive government benefits. No SNAP, Medicaid, or even ACA subsidies. It helps to be able to pay cash. On the other hand, however, she had to turn down numerous career opportunities, and suffered personal losses because of her immigration status. She kept checking with an immigration lawyer to see if any laws or loopholes had opened up that would make it possible for her to gain documentation. Nothing did. Her parents had told her that, in the United States, if she worked hard and stayed out of trouble, that everything would work out in her favor. “The truth is that for many of us that formula just doesn’t work,” she said. She did work hard. She did stay out of trouble. But none of that changed her immigration status. In many ways, she survived because people didn’t question her—an overachieving vice president on Wall Street. For those who are doing whatever work they can to provide for their family, or those in states that make it harder for undocumented students to get a college education—the situation is more precarious. Teachers, Arce explained, will often have to push their immigrant or undocumented students extra hard to take the risk of applying for a dream school. They will need extra help, because they have to jump through extra hoops. Going away from home will seem a little scarier, a little less realistic, and financially untenable. But Arce still remembers the name of the teacher who championed her. She encouraged teachers to be that champion.